When people ask for resources to help raise and/or support a differently gendered child, at the top of my list has long been Dr. Diane Ehrensaft’s book Gender Born, Gender Made. I’ve officially added her latest book (released this month) to that list. The Gender Creative Child: Pathways for Nurturing and Supporting Children Who Live Outside Gender Boxes is another must-read from the person I’ve called the patron saint of kids who don’t conform to traditional gender norms. Dr. Ehrensaft explains gender and children like no one can. And, in her new book, she equips adults to understand and support gender-expansive children the way they deserve to be. I’m often asked how an adult can tell if a child is transgender or gender creative (gender nonconforming). Because I’m not an expert, I typically don’t know the child and giving the wrong answer could seriously impact the child’s life, I’m always hesitant to give my feedback. I do say that when he was younger, C.J. would say “I wish I was a girl” and “I want to be a girl.” As many times as people told me that those phrases meant he was transgender, my mom-gut told me that wasn’t the case. There’s a difference between wanting to be something and genuinely feeling like you are something. 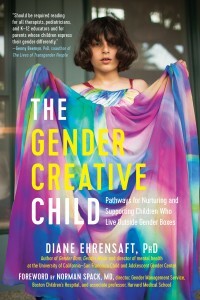 Of course Dr. Ehrensaft explains it better in what was, for me, the most impactful part of The Gender Creative Child. Want to read more? Dr. Ehrensaft will gift a copy of her book to one of my readers. To enter to win, leave a comment below. Any comment. A thought. A joke. A note. A quote. A question. Whatever. A winner will be announced here around 5 p.m. PDT on Friday, April 29. This giveaway has ended. The winner is Yumi! Yumi, please see my reply to your comment below. Thanks to all who entered. This entry was posted in All Posts and tagged Diane Ehrensaft, Gender, gender creative, gender nonconforming, Gender Stereotypes, LGBTQ, parenting, transgender. Bookmark the permalink. Looks like interesting reads, I’ll have to check them out some time. I definitely agree that saying “I wish I was a [opposite gender]” Doesn’t mean they’re trans. Hell, I wished to be a boy throughout my entire childhood (I’m still not even remotely feminine 😐 ), but the thought of being Trans never occurred to me. Whether he is or isn’t, it’s spectacular that he’s got the support of his family. One simple verb will also be one of the signposts that can differentiate a young transgender child from other gender creative children. It is the verb to be. The more I think about this, the more I ask: for whose benefit are we trying to “differentiate”, anyway? Why must we pin a young child down, anyway? A huge part of childhood is playing around and figuring out by experience who they are and by trial and error which of the rather restrictive set of choices society offers them works best for them, and in their experimentation, they may wander back and forth across whatever line of differentiation we invent without actually changing in any fundamental way. As an adult trying to come to terms with this, it’s very clear to me that, as much as anything, it’s about fitting into one of society’s boxes. Inside myself, the question of gender is meaningless: I’m just me. But when I interact with the rest of my species, I have to choose a presentation, and “I’m a woman” or “I’m a man” are pretty much the presentations that the rest of my species will accept. I am opting for “I’m a woman,” but it doesn’t describe who I am, it only describes the public face I choose to present. Lori, I’d LOVE to read this book. I’m soaking up all the resources I can. I’ve been reading your blog for a long time. My 10-year-old son Charlie is gender creative. I’ve been blogging about life with him (originally calling him “my princess boy” – after Cheryl Kilodavis’ book of the same name) – until I stumbled upon the term “gender creative” and realized it was the very term that identified Charlie. This was significant because it was the first term I’d ever heard for a boy like Charlie that had positive connotations, and it just “clicked.” I’m in NC, and doing everything I can to fight against the horrific House Bill 2, which was recently made into law – the broadest, most sweeping and discriminatory anti-LGBTQ law in our history. I’m speaking at a local event, reading excerpts from my blog at an event called “Listen to Your Mother,” on the evening of Wed. May 4th. It’s a cast of 13 writers sharing their stories with both a live audience, and a nationally-known YouTube channel (The Listen to Your Mother Show).This is both exciting and frightening, because I’m sharing my personal thoughts with a potentially huge audience for the very first time. I’m also working to pioneer a movement to include our gender creative children in the LGBTQ flag, because I feel there is no accepted place in society for these children who are not yet ready to identify with sexuality, but definitely are firm in their gender perceptions. My son is ostracized at school because he doesn’t act like a stereotypical boy, and carries a sparkly pink & purple backpack covered with rainbows, kittens, and cupcakes. My older 2 kids have told me how much more accepting high school, and even middle school are for these type of kids. But in elementary school, when it’s not about sexuality just yet, it’s kind of a no-man’s-land. My son is terribly lonely. I recently joined several Facebook groups, reaching out to other local NC parents who are supportively raising gender creative children. I’m trying to start up a “play group” so these kids can just come together and play, totally free of judgment. I mentioned this to Charlie recently, and he was overwhelmed with delight at the idea of playing princess dress up and not being laughed at. Thank you for being such a positive force in this newly and rapidly growing field of knowledge. Gender is not a binary concept anymore, and I want to help with that education & enlightenment. From one gender-creative embracing mom to another, thank you so very much. While the gender non binary does seem to be a bit more understood by more educated people, trust me, that idea is not widely understood nor accepted. When I explain this which is alot, I get called all sorts of stupid to much much worse. A very common question, and these are not nice questions, is that people don’t believe a child as young as 3 has any idea about their sexuality. Which isn’t true of course but you simply can’t get this across. Also gender creative kids are being manipulated by crazy parents which also isn’t true. But this is what you get. So you continue to try but you make such little impact except for those already open to a new idea. Which ain’t many. One thing I’d like to know is why there seems to be actually more gender creative kids, and people in general, today than just a few years ago. Is it because there’s more acceptance or rather less hiding away than before? Or is there something biologically happening? I don’t know that there is any research going on but socially times are changing. So something is happening. As a middle aged hetero white male who paints his toes and shows in public I have had of course some looks but really no negative comments. It’s different so I understand the looks. I’m somewhat surprised though by the lack of negativity because I know how bold and rude people have come to be today. They think nothing of expressing their views to total strangers. As if we care but they seem to think we should for some odd reason. So that tells me some level of “whatever” has seeped into public and social consciousness. So its be interesting to have better knowledge of what is going on. Because something is. I just found your blog after finishing your book this evening. I loved your book and would love to read more! Thanks for the opportunity! “Gender born, gender made” was so helpful to me in my research. I look forward to reading this new book. I’m looking forward to getting into this type of literature to help me navigate the ever-evolving conversations that happen in my elementary school classroom and beyond! I want students to know that there aren’t “boy” toys or clothes or “girl” games or clothes and that certain behaviors can come from anybody. I see more children who don’t feel comfortable to their gender assigned at births who don’t have advocates at home and I want to learn how to be their best advocate, to give them what they need to be able to comfortably express themselves in all ways that are true to them self, especially being able to own and express their sexuality. Would love to win! As a parent of mtf still gathering great info. I am so excited for this book to come out. As I embark on my own parenting journey, I have so much admiration for you in raising boys who are comfortable being who they are. I think it’s easier with girls, just because people are better prepared to accept a “tomboy” over a “tomgirl”. So wonderful to read about so many parents who are so supportive of their children. Working as a school administrator I am trying to become more aware of how often we try to “divide students” by Boys and Girls….really trying to change the language I use. Thanks for sharing your journey with us. There are days I wish I could peel off my skin so I could be who I really am on the inside. This looks like a great resource. Thanks for sharing your family’s journey with the world. So thoughtful and entertaining. We here in North Carolina are dealing with a horrible government situation with HB2. This book would be shared widely if I won! We are learning so much from my grandson. He is the light of my life! Once while taking a bath he said “I’m in disguise…I’m really a girl”. Not a surprise but an affirmation. Always a joy but I want to be a strong support for him. Would love to read more!! Thanks Lori. C.J.’s adventures make my day!! My 7 year old has been saying “I wish I was a girl” or “when I grow up I want to be a girl” since he was 3. We mostly follow his lead and let us guide him where his comfort zone goes. I believe my son is a non conforming gender boy. He loves dolls, hair, makeup and is now trying to grow his hair out so he can braid it. (What a mop that kid has!). But on the flip side, he also likes MInecraft and swords and Darth Vador. All I can do is support whatever toys he likes and whatever clothing he chooses to wear. I continually tell him, “Mommy doesn’t care what you wear when you are out in public…just make sure you’re not nekked!” 🙂 I love your blog. Thank you for sharing all of your ideas, knowledge and resources! I’m a young adult still trying to have conversations with my parents about my non-binary gender. My mom recently said she would be open to reading a book about gender if I gave her one. So I’m on the lookout for a book that I feel accurately describes my experience as someone who feels more trans than cis but doesn’t fall into the traditional trans narrative. I wonder if this one would provide a good starting point? Something to look into. I have two gender nonconfoming children. My daughter who looks like a stereotypical boy and has preferred “boy” things since she was a toddler, and my son who wears dresses, loves the color pink (and anything with sparkles). I firmly believe in letting people express themselves in a way that they are most comfortable. Thank you for this blog, watching other children being raised in an inclusive way makes my heart happy. Anxious to read this new book. When my niece was younger, she would insist she was a boy. She dressed as a boy and wore her hair short for years. But as she entered puberty, things changed for her. She’s 13 now and identifies as a girl and dresses as a girl. I was very surprised at the change, but I guess it can happen. Because her family lives quite far away and we don’t get to see her more than about once a year, I don’t know who she’ll end up being attracted to for a partner. Fortunately, her family has been very supportive and will continue to be so no matter what. Your columns are funny, entertaining, and most importantly educational! Simply put, the mom perspective is the most valuable part. I also love the dad perspective that shows up periodically! We’re ~ 2 years into our journey and are just trying to do right by our child. My youngest child is gender creative. Raising My Rainbow was the first book I read that validated my parenting choices to let my child be who they are. I read Diane Ehrensaft’s Gender Born Gender Made and it added more tools to my tool box. I cannot wait for her new release. Thanks for everything you do, you are an inspiration. I really think if we left humans in their natural state, they’d naturally revert to doing just what they liked. Wearing dresses or racing motorcycles as they grew. No judgement just doing their thing but we put all these crazy constraints on that truly are meaningless by themselves. When you think about it. But what interests me even more is why we’re seeing more of this. Is it just because it’s being more open, it was always there just suppressed, or is there truly numerically more gender inclusive for some reason not yet understood? As a Transgender MTF who is just starting her journey this would be invaluable in explaining gender and not just mine, but everyone’s transition to my young children. How exciting! I would love to have a copy of this book. It would help me a lot when it comes to my nephew(He is 7 years old). His mom started beating him a lot because he didn’t fit indo the image she had of what a boy should be like, so I’m took him in and I’m raising him now. He is a precious little jewel and I love him just the way he is. I wouldn’t change a thing. I’m trying my best to do what’s right for him and I think this book could really help me on my way. Yumi, you’ve won the giveaway! 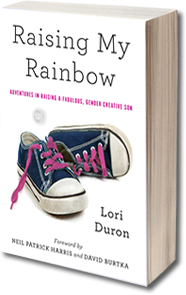 Please email your mailing to me at raisingmyrainbow@gmail.com and I’ll drop the book in the mail to you. Your nephew is really lucky to have you. What a treat to win this book! I’m Nana to a Trans-girl that I love to the moon and back. Any information that helps me to help not only myself, but others understand this journey would be a real gift! Thank you! Very good point about phrasing! Definitely rings true to me. I loved Dr. Ehrensaft’s book and would love to read this as well! 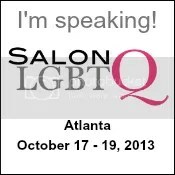 I would love to win this for our PFLAG chapter or our university’s LGBTQ resource center. What about “When I turn five, I’m going to be a girl.”? I think that descriptor, I wish I were a …., or I would like to be a…. vs I am a… is probably the best tell of transgender vs gender creative. It feels right to say it that way and even little kids get that. They never say they are a cowboy or ballerina unless they’re in the costume of one. But even out of costume they will say I want to be a…..
And yes, I’ve seen such rapid movement toward acceptance of non traditional views on this subject in a very very short time. I have no doubt as younger generations experience this in the world the acceptance rate will increase that much faster. The older generations just had such overwhelming training and reinforcement of traditional views on gender that you really can’t expect them to just flip their views overnight. That’s not fair to be judgemental of them. To them it’s a big deal because of their training. Its easy for them to not understand, no matter what they’re told or even feel conflict within themselves. They easily can rationalize away that conflict of they feel it due to the strength of social training. But the younger people will actually see more and will more easily experiment their own feelings and not be so concerned about it. And when it reaches some sort of critical mass it will be a non issue. I would love the chance to read this book. My 9 yr. old transitioned to a girl for over a year, but is currently considering transitioning back to a boy. I’m always on the lookout for more great material to learn about gender creative children. Thanks for sharing this opportunity with us. I can’t wait to read this book. I still refer to Gender Born, Gender Made frequently. I would love to have this book on hand for our parent support group. Thank you Lori and Diane for all your great work!! Your blog and book have been such a resource for me that I have referred both to everyone I know! My 7 year old son is gender creative…loves his dresses, sparkle, bling, and everything in between. Reading your experiences has brought so much joy to know that neither my son nor my family are alone on this journey. Thank you! I am a gender-creative child, but I also identify as trans. This book would be a great addition to my collection! Just purchased it! Thank you for sharing the word about this book, can’t wait to read it! The verb choice seems reasonable to me in understanding what your child is expressing. Growing up, I knew I was a girl but I wished I was a boy. I always had my hair cut short like a boy and would often take my brother’s sport shirts to wear. If my mom picked out a dress for me to wear to school, I would refuse to get out of bed. Finally, my parents just went with it and I was able to be me. I never had an internal voice that felt I was supposed to be born a boy, I just preferred boy things over girl things. I have heard the pain and seen the struggle of friends who are transgender and if people would open their minds and hearts they would understand that this is a quality of life issue. Everyone deserves to live their truth and live a life filled with love and happiness. No one has the right to dictate how the life of another should be lived. “When the egg teaches the hen” looses translated from Romanian, which I think of often raising my gender creative kid. It’s funny. I was watching a video today where Jeremy was running around the apartment singing “kool-aid” over and over again. I called zir my good boy and zie stopped and retorted, “No I’m not!” When I asked what zie was, zie responded “I am awesome”. Zie didn’t have the vocabulary to explain what zie was, but even then zie knew what zie wasn’t. Hi! Thank you for this blog. Our gender journey has been made easier through your personal insight, Dr. Ehrensaft’s work and publishings, as well as our community of LGTB families. I would love to read this new resource! My son is an amazing Tomgirl! I don’t have children of my own, but I have a good friend who has a gender-creative child, and I would love to give this to her. What an outstanding book review of what appears to be a beautiful book. I had never even heard of this book before your review but very much want to read it. Sadly due to recovering lost wages from my 5 weeks of for cancer surgery I will have to wait. I most definitely want the book though and will get it as soon as i can. If I don’t win,I will buy….looks like a fantastic read! My daughter has been a part of her school GSA for two years, and hopes to minor in gender studies at college. I would love to win this for her! It helps reading your blog. As a grandparent I hear people talk negative about gender creative children and I have to just shake my head. Yes it hurts but they don’t know why. If you don’t have an open mind about gender you are loosing out in life. There are so many interesting young people who go unnoticed. People open up your eyes and heart. Love not hate or judge. Do you think we’ll ever get to the point where being a tomgirl will be as accepted as being a tomboy? I am raising a gender creative soon to be 9 year old who is also on the Autism Spectrum. I am having a difficult time finding resources available to me/him despite the mounting correlation between the two. I am probably not making a whole lot of sense but thought I would throw that out there in the event that you ever receive comments from other mom’s who are in a similar situation. Our child just turned 7, currently identifies as “part boy, part girl,” and is also not neurotypical. Her gender-wise therapist has, apparently, never seen anyone quite like her. Nothing like being an outlier among outliers! We often see insistent and consistent statements about lots and lots of things, which makes the gender piece feel less….compelling….in that regard. What I remind myself is that my child seems to have a fairly clear sense of who she is (in many regards), and letting her express that is the right choice. On another topic: thanks for letting me know that Diane Ehrensaft has another book out! Fantastic! There is a chapter in this book (or at least a big section in one chapter–can’t remember exactly), which looks at the overlap of ASD and trans/gender-creative identifies. There have have been some studies that show a correlation, in fact between autism and gender-diverse identities. Ehrensaft has good advice for parents and therapists who are navigating both at the same time. I’ve often thought the same thing about my son, is he trans or GNC… but time will tell! Thank you Lori! I can’t wait to read the book, but I don’t want to win it. I’ll buy it. The children in my life are all grown and not gender creative. Please, give it to someone who needs it for their child! Beginning our journey with our 4 yo. Our motto is (and always has been for all our kiddos) is “happy and healthy-and whatever it takes to get there.) We’re excited for the new read.